The IDEAL 3105 CC 31051111 is an innovative high capacity 2x15mm Micro Cut office shredder with an A3 feed opening suitable for continuous operation. It features an SPS (Safety Protection System) package: electronically controlled, has a transparent safety flap in the feed opening as an additional safety element. It also features an EASY-SWITCH intelligent control element, indicating the operational status of the shredder with varying colour codes and back-lit symbols. 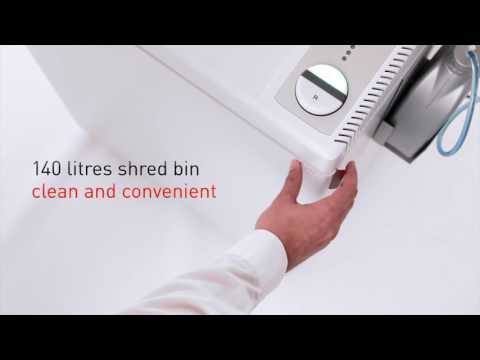 The IDEAL 3105 CC 31051111 machine will automatically reverse and cut-off the power (helps avoid paper jams) and will automatically stop if the shred bin is full. There is also an electronic door protection via a magnetic proximity switch, double motor protection, photo cell controlled automatic start and stop and an energy-saving mode. Also featured is the ECC (Electronic Capacity Control) which gives an indication of the used sheet capacity during the shredding process. There is an automatic oil injection on the cutting shafts during the shredding operation for constantly high shred performance. There is also a convenient 310mm feed opening for A3 (lengthwise) or A4 (lengthwise and width wise). Also featured is a sturdy chain drive with a dust-proof gear box housing. The machine is a high-quality wooden cabinet with a plastic waste bin and is on castors for easy manoeuvrability. The use of a P-5 shredder such as the 3105 CC P-5 will aid your GDPR compliance. This model features a 31cm feed opening that will accept A3, A4 or A5 paper.